Everyone knows that the really big and popular websites have a ton of visitors. But how many? How much does it take to reach the top? We were curious about this ourselves. We’ve all seen the almost absurd numbers involved with the very top sites (like Facebook), but what about website number 50, or 100, or 500? What does it take for a website, in terms of visitors, to reach such a ranking? A while back Google released a list of the 1,000 most-visited websites on the Internet, including estimates of how many worldwide visitors those websites have each month. We used this list as a basis for this little study. To become a top 1,000 website you need at least 4.1 million visitors per month. To become a top 500 website you need at least 7.4 million visitors per month. To become a top 100 website you need at least 22 million visitors per month. To become a top 50 website you need at least 41 million visitors per month. To become a top 10 website you need at least 230 million visitors per month. Facebook is the site behind that last number. And just to be clear, whenever we say “visitors” in this article, we mean unique visitors. To give you a good overview how the visitor numbers are distributed over the top websites, we have created two charts for you. 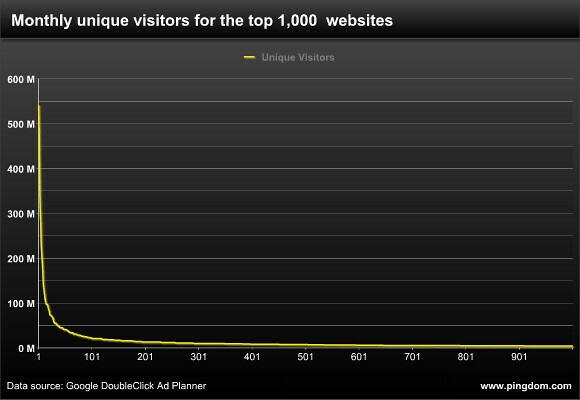 One shows the top 100 websites, and one shows the top 1,000. Each chart shows the number of visitors these websites receive per month. As you can see, a clear pattern emerges, with a sharp increase in visitor numbers for the very top websites, and the curve flattening out more and more the longer down the list you go. The number of visitors websites receive is clearly very much a case of the famous “long tail”. Above: At this scale columns just look messy, so we used a line graph. 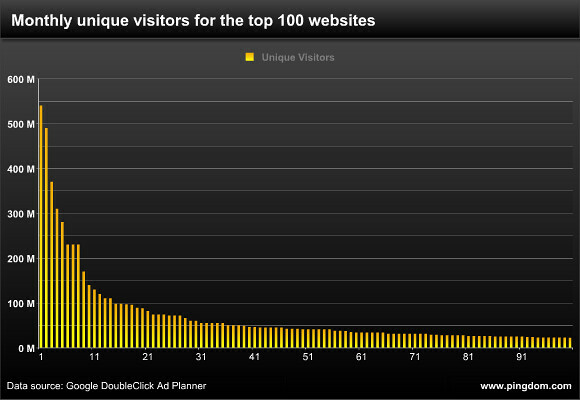 What the above charts show is very much an example of “the long tail” in terms website visitors. If you sum up the number of visitors each website receives, you get very telling ratios when you compare the top 10, top 100 and top 1,000. The top 10 websites get 42% of the visitors to the top 100, and 21% of the visitors to the top 1,000. The top 100 gets 50% of the visitors to the top 1,000. I.e. the top 100 together get as many visitors as the following 900 websites counted together. Visitor numbers are a bit special in that there of course will be be plenty of overlap between the websites. After all, we web users tend to visit more than one site. This overlap will be bigger the higher up in the rankings you go. So there you have it. If you want to break into the top 100 websites, you’ll need at least 22 million visitors per month. If you “only” aim for the top 1,000, you’ll need at least 4.1 million visitors per month. Gee, that can’t be so hard, can it…? This data comes from Google, which in turn uses both its own data and that of third parties to calculate these estimates (and they ARE estimates). One interesting bit about this is that Google tends to exclude most of its own properties/sites from such lists, so the charts above did not include the numbers for Google Search and YouTube, to name a couple of prominent examples. We adjusted the “what it takes to be a top 10 site” number to take this into consideration, since we know that both Google Search and YouTube are top 10 sites. The charts, however, don’t include these sites since we don’t have comparable visitor numbers for them. That said, even with a few site omissions from Google, the overall results should give you a good indication of what it takes, in terms of visitor numbers, to be counted among the top sites of the world. That graph is extremely interesting. The spike that occurs for the top ten sites is incredible. I thought the distribution of visitors would have been more even for the top 100 sites but that shows I was clearly wrong. It would be interesting to make a graph using a logarithmic scale instead of linear. There are two common distribution types, the Bell Curve and the Power Law. Both are natural phenomena. The site-visitor distribution follows a Power Law (read Philipp Ball: How One Thing Leads to Another). For example, family sizes follow a Bell Curve (e.g. a distribution around an average value), but the Power Law always shows a high peak at the left start. Example: a few rich men own 80% of the world. My point is, the power law distribution does not indicate a distribution of quality. Your tool/site/app may be better in every way, but it may still never become popular. Sadly, it’s how the universe works!! As a matter of fact, that unfairness is what keeps large networks stable: small time players can drop out any time, as long as the few big ones stay alive. And it doesnt matter if they are the best, as long as they are big and stable. Like I said, read “Philipp Ball: How One Thing Leads to Another”. Is there an elephant missing from the top of this list? Surely Google gets more visits than Live/Bing but it’s not in the top 100? How many unique visits does Google get? That’s pretty impressive, I must say. It seems to mirror how wealth works, where 2.5% of the people have more than 97% of the money in the United States. Thanks for sharing the data and the graphs. I’d be curious if you extended out to the top 10k sites what kind of traffic you’d be talking about . . . I’m guessing somewhere on the scale of 200k-250k uniques. Any idea if I could grab that data somewhere? The bottom line, as you already demonstrated, is that the top sites out there grab a considerable percentage of the traffic, and I’m going to assume the same plays out for given niches as well. I have made my plan to achieve 1,000 websites.